St. Ambrose logo News and Events. 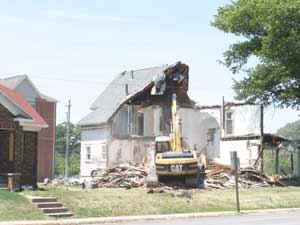 SAU Recycles Old Houses on Harrison St.
University-owned houses that were once home to St. Ambrose students are coming down, giving the university a presence on Harrison Street and creating room for additional parking and green-space. But all the wreckage isn’t heading for the nearest landfill. While plans are not finalized on usage of the land where the houses currently stand, preliminary plans include a brick walkway, an eye-catching entryway at the corner of Lombard and Harrison St. and additional parking. “The east side campus entryway is going to be much more appealing,” added Hannon. Jack Haberman, president of Gateway Redevelopment, and his crew of volunteers have salvaged windows, doors, trim, fireplace mantels, hardware, railings, plumbing fixtures, porches, light fixtures, staircases and even wood floors.